After careful review of your web site we agree that your site deserves the Bearzweb 110% Award. Thank you for giving me the chance to review your site. I can see you've put alot of work into it, and the artwork and pictures are beautiful! I'd like to present you with my Website Excellence Bronze award. Hearty Congratulations! 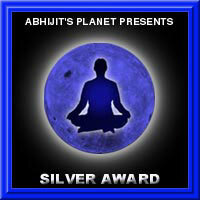 Your Web Site has EARNED Abhijit's Planet Silver Award. Abhijit's Planet Awards are given to those Web Sites; which stand apart from others in terms of its unique design/layout, creativity, useful content, easy navigation, originality, presentation. Your esteemed Web Site certainly obeys the above criteria. Thank you very much for making the Internet a nice place to be. Also thanks a lot for giving us an opportunity to visit and evaluate your Web Site. We enjoyed it thoroughly. abbiamo visitato il tuo sito che troviamo interessante in modo particolare per la possibilità offerta di conoscere le opere di un artista. Graficamente il sito è stato ben realizzato, facile da navigare al suo interno e con una buona scelta di belle foto. I really liked your pages! awesome site! I have viewed your site and I am proud to say you are one of the August Winners of Mesweet's Awards. You have won Mesweet's Bronze Award for your site "Barbara Tampieri Home Page". I really liked how you have featured artists and give information about them and their artwork. That was a very nice touch. I also think it was great that you have a postcard section featuring vintage classic movie stars. "Die Heiße Seite 2000 Bronze". Deine Homepage hat unseren Award "Die Heiße Seite 2000" in Bronze gewonnen. Die Homepage ist nicht für 800x600 ausgelegt. Die Navigation ist recht umständlich. I want to thank you for visiting our site and applying for an award! We have just started this new awards program, and have had 4 people apply. You are the only one out of all of them to win any of our awards! :Barbara Tampieri: loves art. She introduces painters and photographers and presents her beautiful landscape fotos of Vienna and the Dolomites. Additionally, she as a huge collection of postcards showing movie stars. The whole is presented in a plain but noble design and presented in a very readable style. It's something different! 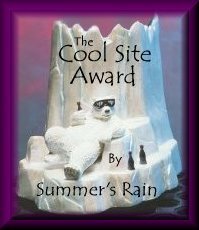 The Comedy Zone is pleased to award you the 'Cool Site'BRONZE award for your website. The Cool Site award is made to web sites who's intention is to provide the visitor with useful and informative content, with extra credit given to good design, decent graphics, ease of navigation and fast loading times. As your site scored over 75% against the overall judging criteria, I am pleased to present you with the BRONZE award. Thank you for allowing us the pleasure of visiting your website and good luck in the future. Aardvark Archie is pleased to award you our 'Cool Site' GOLD award for your website. The Cool Site award is made to web sites who's intention is to provide the visitor with useful and informative content, with extra credit given to good design, decent graphics, ease of navigation and fast loading times. As your site scored over 90% against the overall judging criteria, I am pleased to present you with the GOLD award.